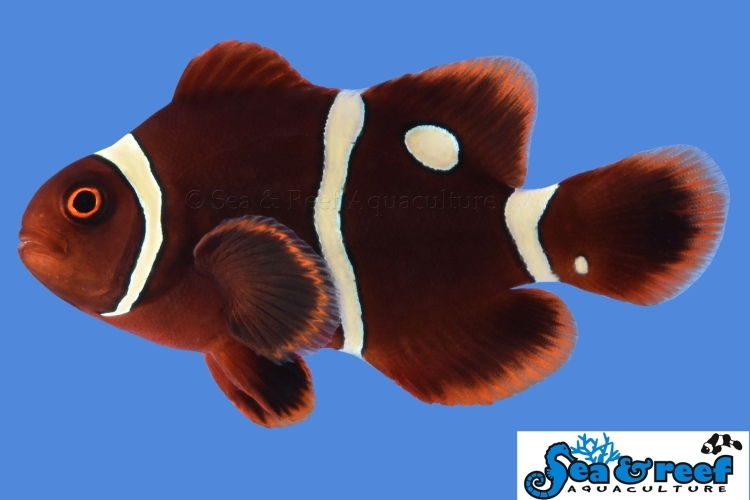 The Gold Dot Maroon is a designer clownfish based on the Gold Stripe Maroon Clownfish. Several designer clownfish strains have been developed from Gold Stripe Maroon Clownfish, including the Gold Flake Maroon Clownfish and the Gold Nugget Maroon Clownfish. The Gold Dot Maroon has one or more round spots on its body. The spots typically occur on the posterior part of the body, but not always. Each fish is unique. Like the Gold Stripe Maroon, the stripes start out white and as the fish grows and matures, a color change happens with their stripes and spots deepening to a beautiful golden yellow. Gold Dot Maroon Clownfish will readily accept a wide variety of host anemones and many hobbyists keep them with the popular and hardy Bubble Tip Anemone (Entacmaea quadricolor). Clownfish do not require host anemones to survive or thrive. However, in most cases they will readily accept them. For Gold Dot Maroon Clownfish we recommend the popular and hardy Bubble Tip Anemone (Entacmaea quadricolor).